Hooray for Stuart Gibbs and fun middle grade mysteries! 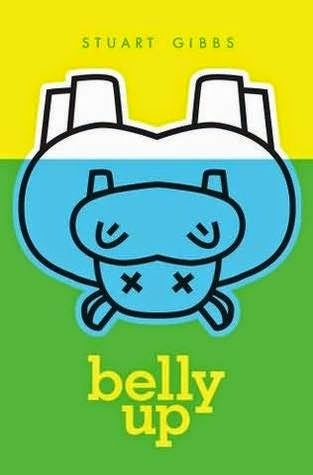 After the heaviness of The Winter Prince, I decided on something light and selected Belly Up, based on the cover. I was so happy to find a successor to Carl Hiaasen's animal mysteries. Teddy Fitzroy gets to live in the world's greatest zoo, FunJungle, where his parents are employees and he can spend his day exploring the park. It's different from where he grew up in the Congo, but at least it's safe. Or it was, until someone murdered the park's mascot, Henry the Hippo, and then decided that Teddy was too curious. Now, he has to figure out who is the murderer, before he becomes the next victim. This was an engaging and fun book that would make a great read aloud...maybe the one I will start with my class after we finish The Fourteenth Goldfish. I was happy to learn that there is a sequel, Poached, which I will be seeking out. The more modern, appealing mysteries I can recommend to students, the better!